Puréed cantaloupe that has been frozen has a remarkably creamy texture that almost tastes like ice cream. Even with perfectly ripe fruit, you'll need to add a bit of sugar, both to sweeten the fruit (frozen things taste less sweet than they would at room temperature) and to make the texture sorbet-like instead of ice cube-like, but the real point of this recipe is to bring out as much of the natural cantaloupe flavor as possible. No cantaloupe? No problem! Use any melon you like, although less-sweet melons might require more sugar syrup than do most cantaloupes. In a small saucepan, bring the sugar and 1 cup water to a boil. Reduce the heat to maintain a steady simmer and cook until it thickens slightly, about 10 minutes. Take off the heat and let cool to room temperature. While the sugar syrup cools, peel, seed, and cut the melon into cubes: Cut off the ends of the melon and set it upright (one of the cut sides down) on a cutting board. Remove the peel by cutting down along the sides all the way around. Cut the melon in half, scoop out and discard the seeds, and cut the melon into cubes. Transfer the melon to a blender or a food processor and whirl until completely and utterly smooth and puréed. You will likely need to do this in batches, being sure to thoroughly purée each batch. Transfer each batch to the same large bowl. Add about half of the cooled sugar syrup to the puréed melon. Taste. It should be a bit sweeter than you want the final sorbet to taste. Add more sugar syrup, about 1 tablespoon at a time, until slightly oversweet. Cover and chill the mixture in the refrigerator for at least 1 hour and up to overnight. Chilling the mixture before freezing it will help ensure the final sorbet has as creamy a texture as possible, so don't skip this step if you can avoid it. Freeze the mixture in an ice cream maker according to the manufacturer's instructions. No ice cream maker? No worries. Pour the chilled mixture into a metal baking pan and freeze, stirring every 30 to 60 minutes, until it's frozen through. Be sure to scrape the icy bits from the sides of the pan into the center. How long this will take will depend on your freezer. This recipe works well with any melon, really, including honeydew and watermelon, but the key to a great-tasting end product is using melon that is ripe and flavorful. If it's not naturally sweet, adding more sugar syrup will take care of that problem. 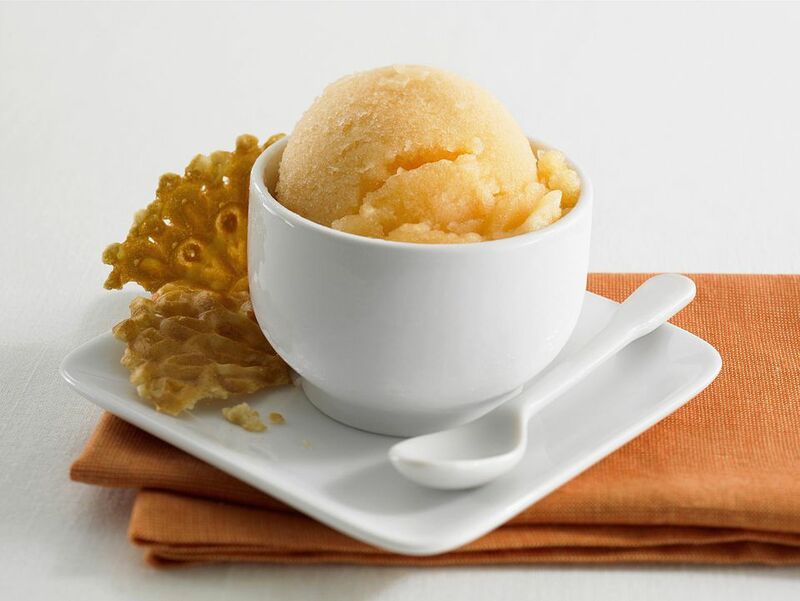 To make an orange-cantaloupe sorbet, add 1/4 cup fresh orange juice, and an optional 1 tablespoon of Cointreau, triple sec, or other orange-flavored liqueur to the blender with the melon and continue with the recipe. Serve the sorbet in scooped-out orange halves and garnish with orange rind. For a refreshing honeydew-lime sorbet, add 1/4 cup sweetened lime juice (like Rose's) and an optional 1 tablespoon of Midori liqueur. Serve it with lime zest or sprigs of fresh mint if desired. Replace the cantaloupe with watermelon, add 1/4 cup pomegranate juice, and an optional 1 tablespoon of grenadine. If you like, serve a scoop of this watermelon-pomegranate sorbet with a few fresh pomegranate arils.